Arsenal played hosts to Leicester in a match which highlighted the superiority of team-tactical strengths over individual abilities. Leicester are one of the strategically strongest teams in England this year through their stable defending and great transition game whilst Arsenal’s structuring issues again were on show. It took a dismissal for the control of the game to shift as Wenger’s side took advantage of their numerical superiority after Simpson saw a second yellow. Ranieri picked the same starting eleven for the sixth consecutive match as they featured in their usual 4-4-2 formation whilst Arsenal made two changes to the lineup as Coquelin and Mertesacker returned to the 4-2-3-1. Whilst more attention has been payed to Leicester excellent transition game through Vardy and Mahrez, one must not overlook their strong defensive organisation which is crucial in making these transitions possible. Ranieri’s side have been a welcome change in the Premier League as they employ a zonal marking system with man-orientations which sees them stay stable and compact in a 4-4-1-1 shape. For more on the different forms of zonal marking, click the image to be taken to RM’s excellent theory article. Within such a defence, a team will organize themselves zonally where the primary reference point for the defenders is the opposition. When not tasked with covering a nearby attacker, the team will maintain their shape in their base positions and cover the space in a zonal structure. However when a forward moves within a defender’s vicinity they will flexibly orient themselves within their space to cover this player by keeping a certain distance away from them where they can apply pressure on a position level. It’s clear to see the difference between this scheme and man-marking where the defender simply tracks his man with little recognition of structure and spatial aspects. Instead, the team maintain their zonal shape and cover the space whilst adjusting to simultaneously cover a nearby player too. Through this defence, Leicester maintained a generally good access to the Arsenal midfield and attack whilst maintaining stability and a strong shape. The flexibility of this defensive scheme stopped them from becoming disorganised against Arsenal’s movement off of the ball as they maintained good balance before the red card. Another component of their defence which separates them from the majority of English clubs is the defensive support of the two wide players. Countless comments have been made on their hard-working nature but far more important is their orientation within the structure. Whilst Kanté is excellent in defence (whilst being very strong with the ball too, something largely overlooked for his physical and defensive attributes) and Drinkwater also strong, they received good support from the wingers as the team defended well as a group. Through their zonal defence, they maintained a clear shape and the wingers didn’t closely mark the Arsenal full-backs – a role which most wingers are accustomed to in the English leagues. Instead they would maintain good spacing between the full-back and the centre of the pitch, meaning that they could provide strong support to the midfield pairing. Whilst most wingers are disconnected in their individualist man-marking role, Mahrez and Albrighton are important to the collective stability through supporting the centre and helping them achieve good spatial control in the middle of the pitch. Leicester’s compactness must also be noted as it plays an important role in their organisation. Through the zonal scheme they maintain their shape and do so with strong distances both horizontally and vertically. There were some issues in the spatial compactness, with some open spaces between the midfield and defence but they generally restricted Arsenal’s access through good pressure. Ranieri’s side did show some issues in their defensive access during moments when neither forward could support the central midfielders. Usually it was Okazaki dropping into the 10 area where he would cover an Arsenal midfielder and maintain access through their man-orientations. However when this support was not on offer, Leicester showed some problems. As Drinkwater and Kante were occupied with their own coverage of the likes of Özil and Oxlade-Chamberlain, they weren’t in a position to create sufficient defensive access in the now-open 10 space. Fortunately for the away side, it was most often Coquelin who had these opportunities and the 6 wasn’t able to take advantage. Arsenal’s possession game has been plagued for seasons now by a weak structure with the ball which is poorly co-ordinated. Their shape is rather free-form as the midfield have freedom to roam from their positions quite commonly whilst Aaron Ramsey makes his usual forward movements up field. Arsenal’s dominance of possession against Leicester’s mid-low block suggests a control that they very rarely had, which was in many ways because of their sub-par spacing. A scene from the 11th minute. They again showed inappropriate distances between the structure with weak spatial occupation and staggering. 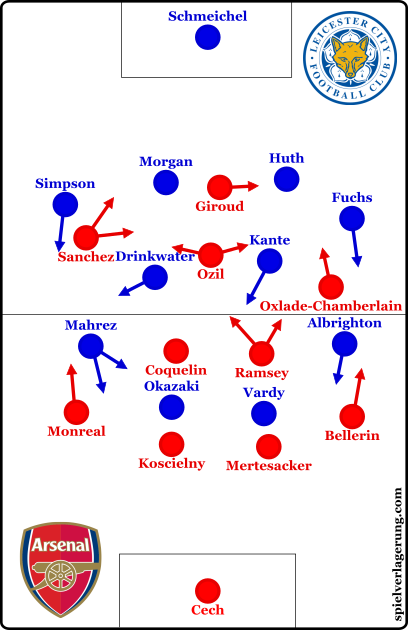 It was common to see straight lines consisting of 3-4 Arsenal players in possession as the connections were few and far between. The lack of passing options caused difficulties in movement of the ball as their switches were ineffective whilst integration of Özil was difficult. In some cases they were more ball-oriented in their shape though this was ultimately counterproductive as it made further example of their weak spatial occupation with too short distances between players. Many of the attacks resorted to possession through wide areas as their lack of connections made access difficult through the middle. They vary rarely looked able to circulate the ball through the centre of the pitch as the inside players failed to space themselves appropriately to enable the ball to move between themselves correctly. In these wider attacks they showed some promise when moving the ball back inside through half-space combinations but that wasn’t sufficient against a stable Leicester defence. The weak structuring in possession translates to issues upon turnover of the ball too. 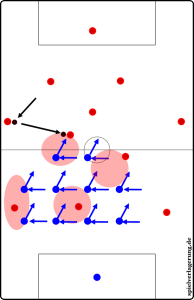 The lack of passing options with the ball results in a lack of defensive connections upon losing it as counterpressing becomes difficult to execute. Although it wasn’t exploited to its fullest by Leicester, their inability to exert immediate pressure gives them great instability in transition with particularly large distances between players in midfield. Danny Simpson’s dismissal was a pivotal moment in the game as Leicester moved to a 4-4-1 with Gray and Wasilewski replacing Mahrez and Okazaki. Wenger made his own changes too with Walcott replacing Coquelin whilst Ramsey moved deeper. With Leicester a man down their spatial coverage became progressively worse as open gaps were more prevalent between the two lines of four. Their man-orientations became more difficult to maintain and stability was lost as Arsenal moved more players forward and were able to create chances much better with greater access between the lines. Leicester made another tactically and strategically good performance and controlled the game without the ball up until the red card. Though Arsenal were poor for the majority of the game, they capitalised on Simpson’s dismissal and were able to dominate from then onwards. Within this final period they created well and ultimately the final result wasn’t so much of a surprise as they created 2xg once it became 11v10.